It seems rather ludicrous on the surface. He’s won two NBA MVP awards and could be on the verge of winning his fourth title in five seasons. But since his days as a high school baller in North Carolina. Stephen Wardell Curry has been underestimated. First, it was the Duke Blue Devils failing to offer the smallish guard a scholarship. Curry would ultimately have to tag along with a small-school in Davidson while his younger brother, Seth Curry, starred for Coach K at Duke. Even after shocking the college basketball world in leading Davidson to the Elite 8 in the 2008 NCAA Tournament, he was passed over for fellow guards Jonny Flynn and Ricky Rubio in the draft. 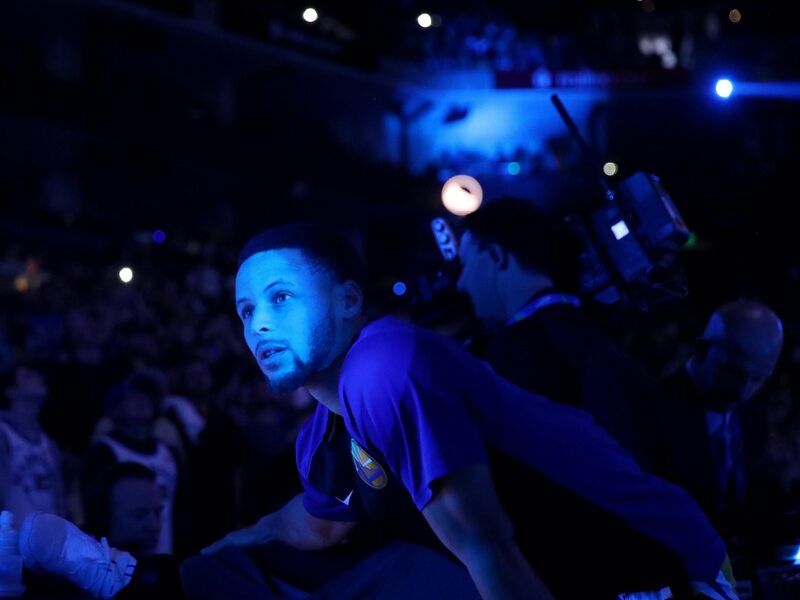 Curry ultimately landed with the NBA’s laughingstock — the Golden State Warriors — at No. 7 overall in the 2009 NBA Draft. Curry had privately been hoping the New York Knicks would select him. The rest is history. Actually, not so fast. What if we told you that the legend of Wardell is currently the NBA’s most underrated player? It’s not so hard to comprehend when you look at the backstory. Building a dynasty: These Warriors were nothing before Curry. In the 32 years before Curry joined the Warriors in 2009-10, this organization had made a combined six playoff appearances. Golden State just clinched its sixth consecutive postseason appearance with Curry at the helm. We’re talking about an organization that was the biggest laughingstock stock in the NBA. Outside of the 2006-07 “We Believe” team, Golden State had finished with 50-plus losses eight times in 16 seasons. Ouch! Earning the trust: Warriors fans were not exactly keen on keeping Curry. Warriors owner Joe Lacob remembers if fondly. His first appearance inside Oracle Arena in that role back in 2012 resulted in Lacob being booed by the fans. It came during Chris Mullins’ jersey retirement ceremony and was an ugly scene. Why the booing? Golden State had just traded franchise cornerstone Monta Ellis for an injured Andrew Bogut. This was to make room for Curry in the backcourt. Warriors fans were not happy. With a history of ankle injuries, they preferred Ellis over Stephen. Imagine that. Before Durant: A first title in 40 years, and 73 wins. Fans and the media have concluded that Kevin Durant’s decision to sign with Golden State after its 73-win season ruined the NBA. However, it’s important to note that these Warriors won their first title with Stephen Curry leading the charge back 2014-15. How good was Curry that season? He averaged nearly 24 points per game and shot 44 percent from distance. The following season saw Golden State win an NBA record 73 games. Curry himself averaged 30 points per game. The Warriors ended up blowing a 3-1 NBA Finals lead with Curry hampered by injured. After Durant: Still the face of the dynasty. One of the reasons Durant might be thinking about leaving the Warriors is that he’ll always play second fiddle to Curry in the Bay Area. This will never change. A homegrown talent, Curry will always be No. 1 for Warriors fans. It’s not even debatable right now. Even without Durant in the mix, these Warriors would still be top-end title contenders. That’s all about Curry. Period! The numbers: They don’t lie. Since the start of last season, the Warriors are 22-20 in games that Curry misses. They are 86-27 in the games that he’s suited up in. For comparison’s sake, Golden State boasts a 12-6 record in games Kevin Durant has missed. The team is 10-3 in outings that it has played with Curry in the mix and KD absent. This tells us a story of a championship squad that relies more on Curry than Durant. Given that most believe Durant is the second-best player of this generation, it’s alarming to realize just how much more important Curry is. Some believe this coming July will be a reckoning for the Warriors. Durant, Klay Thompson and DeMarcus Cousins are all slated to become free agents. Golden State can’t afford to lose all three. But if the team were to retain Klay, it would still be top-end title contenders. That’s the Curry effect. And that’s why he’s the Association’s most underrated superstar. Period!